As a Natural Movement Practitioner, how do I create my own sessions, that use all of these great movements that I’ve been learning? As a MovNat Certified Trainer, how do I structure all these Natural Movement skills into a program that’s truly beneficial to my client? Programming physical activity is about creating a structure that leads to consistent practice and results. It can be a very specific and tailored process, as both the needs and environment can vary widely – be it for a large or small group or an individual client; in a gym or outside. The art is about having the ability to create a plan that is both successful and satisfying for the people executing it. These warm ups usually last from 5 to 10 minutes. This will depend on how “cold” a client is, how cold the environment is and the movements/skills that are to follow. The NDS is a sensory-rich stimulation of movements that simulate those learned during human development. Think of how an infant learns to move their body in order to navigate the world. These patterns of movement usually start from the ground (either laying or sitting) and can end in a standing position. Through this sequence of mostly ground movements, you can cover breathing, posture, balance, sitting, crawling, standing and walking. And significantly generate the heat to warm the body up and get it ready for the next evolution. The head-to-toe dynamic warm up takes the client through an easy to execute set of movements that can be done in either a light or more aggressive manner. Most of these movements are done from a standing position and are well-suited for an environment, where getting on the ground is not the desired choice. Or for when the client is resistant to getting down low – due to de-conditioning or plain old pride. The dynamic movements focus on warming the body up; not stretching it out. This means that the body keeps moving and is not held in a static, stretching position for a significantly long period of time. This type of warm up is very effective in colder environments — e.g. when it’s chilly outside. A contextual warm up involves “walking through” the skill you’d like to work on. Starting out at a light/casual pace, you slowly build momentum in your movements, to the point that you’re completely warmed up for your next activity. For instance, a good contextual warm up for the forward jump would be to do some general landing drills. You’d steadily increase height and distance, until you’re full-on practicing your jumping technique. And for practicing some climbing techniques, you may start off by just doing dead hangs. Then some forward/side swinging. Gradually moving into the particular climbing skill(s) you’d like to cover. To add quite a bit of fun into the start of a training session, you can implement a playful warm up. This type of warm up gets you positively excited, by using a bit of “gamification.” It basically gets you to move because you’re trying to “win” the impromptu game that you’re playing. An example would be to bounce a tennis ball and catch it. You’d start out by bouncing it nice and easy. And over the span of 5 or 10 minutes you’re running, lunging and sliding to catch it as it bounces off of the ground, wall or from high in the sky. With a partner or small group, it becomes even more interesting and playful. And it takes a lot to keep from laughing and smiling during the process. For example, the forward jump and the shoulder crawl. During the first 15-minute block, you’d practice the forward jump regressions/progressions that are suitable for your skill level. Finding the desired balance between volume, intensity and complexity is where the true art of programming comes in. Whether you perform high reps of sub-maximal jumps, while focusing on the technical aspects of the jump – or perform a few reps of near maximal effort and/or landing on a complex surface, depends on your training status and goals. This is the portion of your training session that demands the highest level of attention and concentration. It’s where you’re expected to learn something about that skill and yourself. All the while, using the time to safely work into the most challenging and mindful part of the training session. 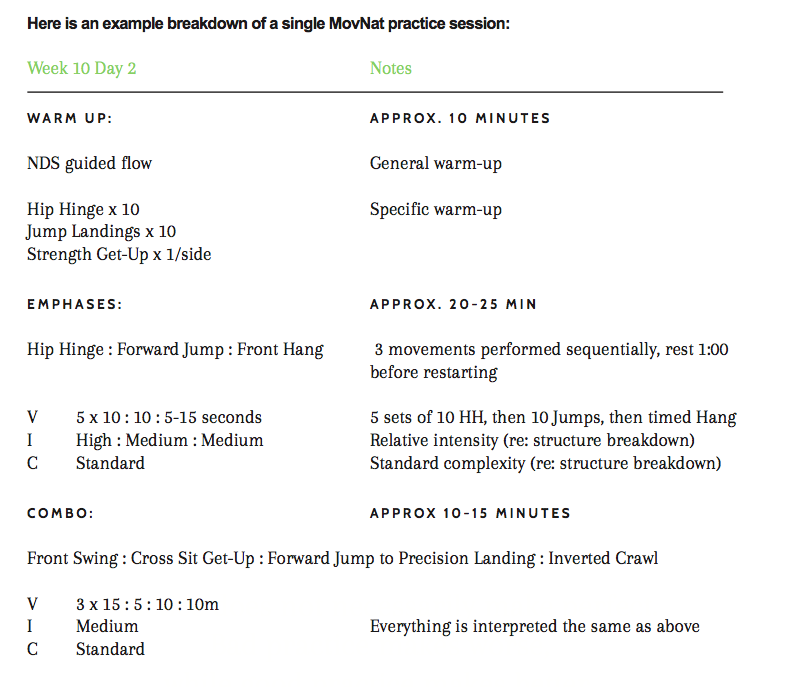 You can consider the MovNat Combo, the circuit training of Natural Movement. This drill uses a combination of 3 to 5 diverse skills, successively repeated for — generally – 5 minutes or 3 to 5 rounds. Depending on your skill level and conditioning, the amount time it’ll take you to complete a round does vary. Generally speaking, you’ll want to choose repetitions and distances that will allow you to get at least three rounds done during a MovNat Combo. This will help to keep you from getting bogged down on one skill for too long; which can take away from the overall benefit of the evolution. Forward & backward balance walk, on a 2×4 that is 8-feet long. You’d perform this combo as many times as you effectively can, within the 5-minute time limit, taking care to gauge your pace during the entire evolution. As well, you’re always taking personal responsibility for your actions and your ability to continue. After an invigorating MovNat Combo, you’ll be ready for a nice cool down. And a cool down is designed to bring you back to a fully functional state. The movements can start off a bit vigorous. But they should wind down by the end of the 5-minute period. A cool down could be a done through some walking, with some standing or sitting reaches. Or even a head-to-toe shake out of the body. The main thing to consider is that you’re looking to leave your session in a good physical and mental state, ready to take on the rest of your day or evening. With all that said, there are many ways to dress a cat. And this is a template that you can use to provide structure for some terrific and effective Natural Movement sessions. But also consider that you can break each one of these sections into its own little workout, over the span of one or several days. Or you could expand or condense each segment to create a practice session that better suits your goals and time limitations. Consider this template an opportunity to structure a Natural Movement program that will get you where you need to go. Or to help your client get the most out of their training. So, take the time to give it a try. And let’s hear of some of your successes. And how you’ve tweaked it, to make it your own. Note: This training session format is flexible and can be adapted to your unique needs and goals. If you’d like to learn more about how to program natural movement for the best results, please join us as at a MovNat Certification. About the Author: Eric Brown is a former U.S. Navy SEAL, Master Training Specialist and Naval Special Warfare Instructor of the Year. Having trained and instructed in a variety of physical and mental disciplines — e.g. obstacle courses, calisthenics, rescue swimming, ROPES challenge courses, combative arts, neuro-associative conditioning — Eric has experienced a wide breadth of life lessons that have brought him to a deeper understanding of his role in life and society. A family man, he enjoys moving with his wife and young son, fully expressing his “NATM – Never Afraid to Move” way of life. 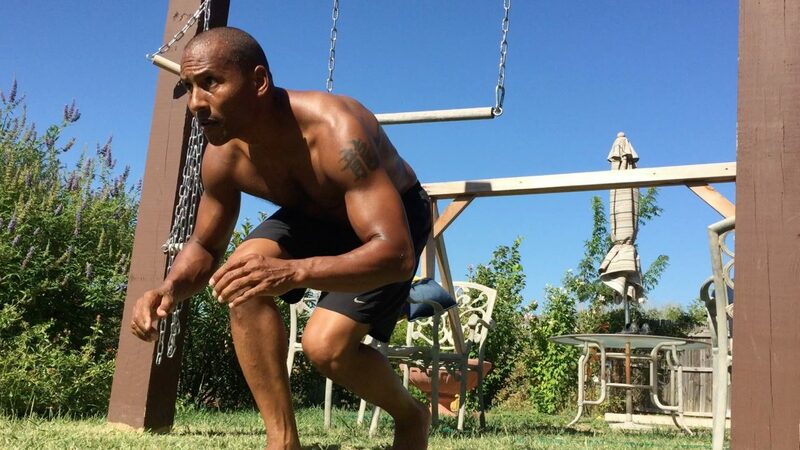 As a Level 3 MovNat Certified Trainer, his mission is to increase the quality of life for the young and old – letting those open to the training know that consistency is the key to moving and feeling better. As he often says, “Patiently persistent practice, produces proper practical progression.” You can learn more about Eric at his website here: www.MovNatDallas.com.